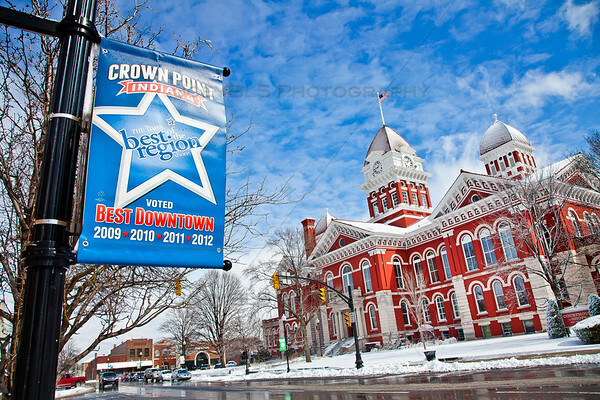 Downtown Crown Point, Indiana at the Old Lake County Court House after a winter snow. The downtown Crown Point square is a major attraction for locals due to it’s numerous shops and restaurants on or near the square, plus its convenient location in central Lake County. Downtown Crown Point, Indiana in the Winter Snow by Joey B. Lax-Salinas is licensed under a Creative Commons Attribution-NonCommercial-NoDerivs 3.0 Unported License. Permissions beyond the scope of this license may be available at http://www.joeyblsphotography.com.